JP Rangaswami is thinking - thinking about cognitive surplus in this fairly long piece: Thinking about cognitive surplus in the enterprise. This quote about knowledge management comes about halfway down the page. I’ve watched attempts at knowledge management in the enterprise fail for decades, and rationalised the failures in many ways. The technology wasn’t ready. People didn’t want to share. Management didn’t want people to share. And so on and so forth. JP suggests that the very nature of knowledge work is lumpy - that there are heavy times and low times. There is cognitive surplus in knowledge work. In the past, we've been too afraid to acknowledge this - a fear based on our measurement systems (which are based on old models of business). We need to acknowledge this lumpy profile and take advantage of of the "low points" to take care of the next time where the lumps of work are big. Coincidentally, I said almost this same thing on Quora in response to a question about productivity techniques - just yesterday. Thanks to Luis for pointing me to these articles in Twitter. 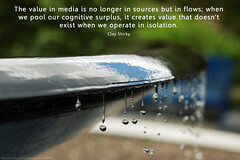 I think Clay Shirky's Cognitive Surplus is now even higher on my to-read list. JP has another follow-up post with more on KM and cognitive surplus. And don't forget to check out the comments on both pieces.